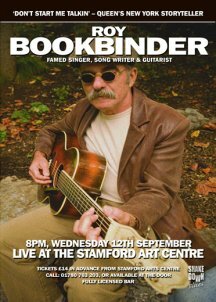 Roy BookbinderRoy Bookbinder was born and bred in Queens, New York and was influenced at an early age by seeing and hearing Thurston Harris perform his big hit �Do What You Did When You Did What You Done Last Night� at a Brooklyn Paramount Rock and Roll Show. Having become a teenage rebel with out a cause he joined the navy to antagonize his parents where he was further influenced by the blues record collection of a fellow seaman. Upon discharge he enrolled at a college in Newport Rhode Island just in time to visit the 1965 Newport Jazz Festival, which featured Son House, Muddy Waters, and Big Mama Thornton etc; after this experience he spent most of his days at college learning to play guitar. Leaving college he went back to New York and met Ramblin� Jack Elliot whose moniker started him thinking about a life as a �traveling man�. Joining the beatniks in Greenwich Village he met Dave Van Ronk who introduced him to Gary Davis. Eventually Davis took him on as a student and after a few lessons he traveled with the Reverend for a couple of years. Leaving Davis and returning to New York he found a job as a councilor for an orphanage in the South Bronx. It was during this time that he became acquainted with the music of Pink Anderson through the latter�s Prestige Recordings. Taking a holiday from the orphanage to find Anderson he eventually tracked him down in Spartanburg, South Carolina. Pink was in bad health, living in dire poverty and was surviving on dog food. Roy fed Pink and the two went on the road together. Back in New York, in 1967, Roy recorded a song for a Blue Goose anthology and the following year recorded a couple more for a Kicking Mule compilation. About this time Bookbinder met up with both Robert Tilling and Jo-Ann Kelly and was fascinated enough by their tales of the English �Blues boom� that he quit his day job in 1970 and sold his car to buy an airline ticket to London. Here he was helped by Jo-Ann with a place to crash and the advice to �play all the Folk clubs and go to Dobell�s Record Shop�. This led to him opening for an Arthur Big Boy Crudup show at the Hunters Club, which then led to a Shakedown Gig at the Halcyon Pub in Peterborough. News of this astonishing gig obviously got out and in 1971 he recorded the brilliant Adelphi album �Travelin� Man�. This was quickly followed by a couple of Blue Goose albums. In 1976 he bought a motor home, left New York for good and traveled the length and breadth of the United States stopping only to play in clubs, cafes and festivals. He recorded an album for Flying Fish records and then hooked up with Bonnie Rait for a national tour. In Nashville Roy was picked up by the �Hillbilly crowd� and this eventually led to thirty eight appearances on the Ralph Emery�s �Nashville Now� TV programme. In 1988 Rounder signed Roy and recorded four extremely well received albums. Since then he has played regularly at blues, folk and country venues as well as numerous festivals around the world including �The Blues to Bop Festival� in Lugano, Switzerland, the prestigious Kerrville Folk Festival in Tennessee and the exemplary Stamford Guitar Festival. He now lives in Florida, travels much less and has issued two excellent CD�s on his own Peg Leg Record Label. Like Doug MacLeod Roy is a superb singer, guitarist and a humorous story teller.